Saudi Arabia and Japanese powerhouse SoftBank announced they will build a solar power plant so huge — 200 gigawatts — that it will exceed the amount of solar power installed in the entire world in 2017 by 30%. Once completed in 2030, it will triple the amount of electricity generated by Saudi Arabia, which currently gets all its power from burning oil and natural gas. The project is projected to cost $200 billion. 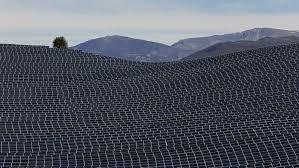 With current technology, solar panels capable of generating 200 GW would likely cover 5,000 sq km. An area larger than the the world’s largest cities.